The Benjamin ComfyNest offers support and restriction for premature, dysmature and sick babies. Research proved that premature babies can hold their body temperatures at a better level in a nest, making them grow better. The restriction provided by the nest has a positive effect on respiration and emotional rest. Positioning and restriction limit stress, and stimulate healthy sleeping behaviour as well as neurological development. 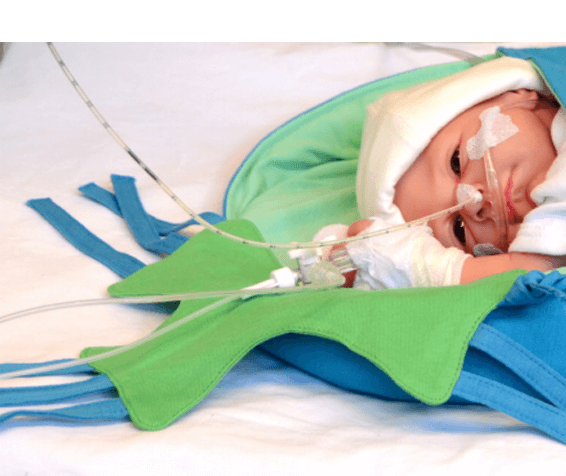 The Benjamin ComfyNest, and its matching accessories, were developed to position, support and restrict the premature baby or the baby with low birth weight in various positions. 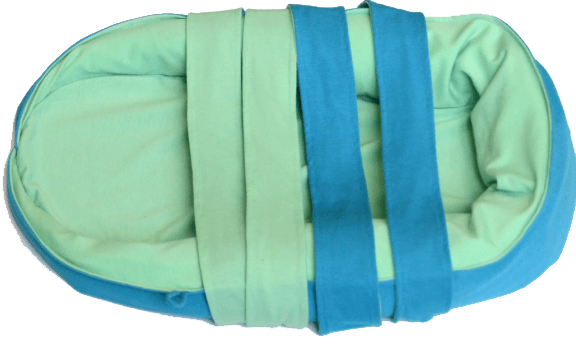 The ComfyNest offers the possibility to position the baby in a midline orientation and thus promotes hand-mouth and hand-hand contact, which will make the baby feel more comfortable and, consequently, better capable of self-regulation. In the ComfyNest a baby can be weighed, moved, examined and transported, restricting stress to a minimum. The flexible and smooth inside roller makes it possible to easily reduce or increase the nest. The four straps offer ample opportunity to support the baby in the right position and to offer restriction from above. The straps help the baby maintain the midline position. They can be attached both straight and crossed around the baby and the nest. Available in two sizes: size Small (500-1500 grammes) and size Large (1500-2500 grammes). Has an inside roller which can be wiped off with water, is filled with grains, and has a separate washable cover. There is anti-slip material at the bottom of the parts. The outer covers are made of an advanced technical fabric consisting of a mix of polyester and cotton. This fabric dries four times as fast as cotton, does not discolour or shrink and remains odourfree. The ComfyNest was developed in cooperation with NIDCAP trained specialists on the basis of the latest insights in the field of developmental care. The Benjamin ComfyNest is used in many Dutch and foreign hospitals. It is valued by professionals and parents for the quality of the materials, the comfort for the babies and its child-friendly appearance. The Benjamin ComfyStar is a soft grain bag. It is used to support the baby where necessary. It can be placed around head, neck or hips or under or against a little arm or leg. The Benjamin ComfyStar can also be reduced by folding it. In order to develop a round shape of the head and to prevent a preference position it is important that the head is regularly turned. 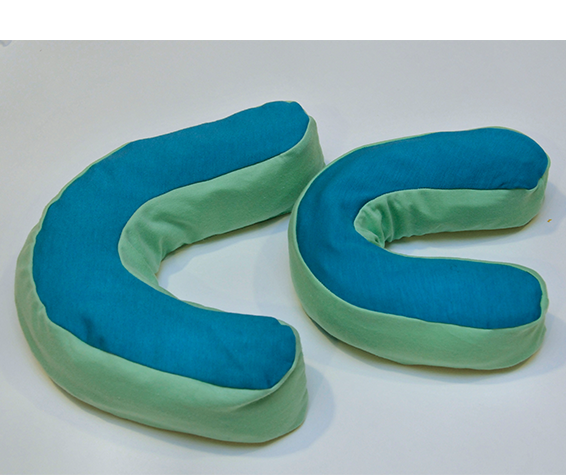 The ComfyPillow is used to bring the head in the right position. 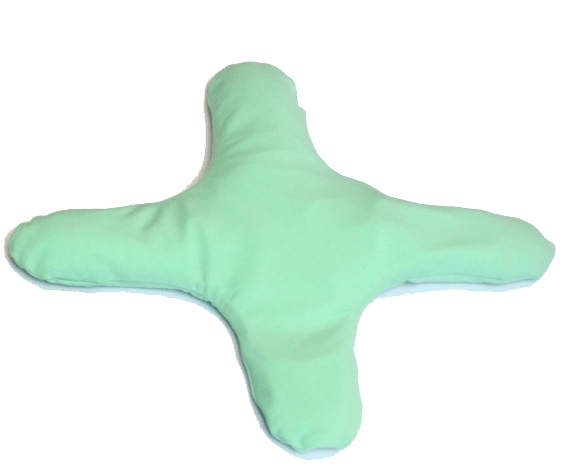 The ComfyPillow can also support the head when the child gets artificial respiration. Odour plays an essential part in mother-child bonding. The presence of the mother’s odour results in stress relief for the baby. The use of the Benjamin ComfyKiss scent pad may contribute to this. The scent pad is worn on the body by the mother or the father.